HPLC is a technique that uses high pressure to push samples through a chromatography column to separate out the compounds that make up the sample. The process of separating different compounds depends on the type of chromatography column used. Several different types of columns are described below. Once the molecules make it through the column, they will be detected by some sort of detector. Typically, this detector is a UV detector, but other detectors such as refractive index detectors, laser light scattering detectors, fluorescence detectors and thermal conductivity detectors can also be used. Mass spectrometers can also be used (See LC-MS). When discussing HPLC it is important to understand the difference between the mobile phase and stationary phase. The mobile phase is also called the eluent. It is the liquid that moves the samples through instrument and through the columns. Examples of the mobile phase include water, methanol, acetonitrile. The stationary phase is the column that the sample passes through. Molecules are separated by the speed at which they are able to pass through the column. For example, size exclusion chromatography (SEC) columns allows small molecules to enter into pores within the column causing them to take a longer route through the column. Larger molecules are too big to enter these pores and thus pass straight through the column and elute more quickly. Both the retention time and the analysis from the detector are used to make a chromatograph which can be analyzed by a chemist. 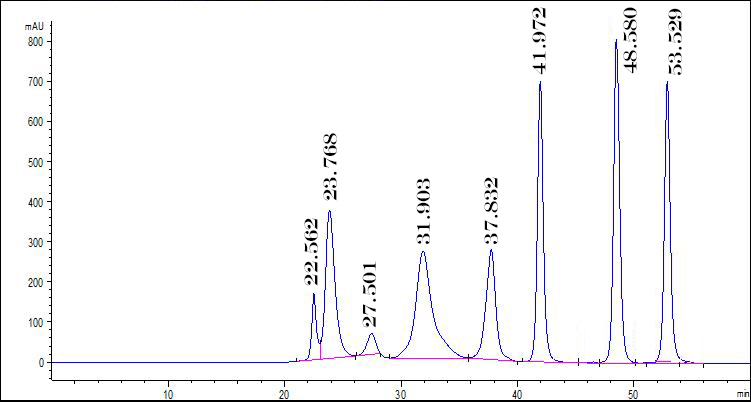 Below is an example of an HPLC chromatograph in which several impurities are identified. SEC Chromatograph showing the peak of the drug product and various impurities. Size Exclusion separates molecules based on size using pores of different sizes within the column. The larger molecules are excluded from the pores and take a more direct route though the column while smaller molecules enter into the pores and have a more convoluted route through the column and therefore take longer to elute. Ion exchange separates molecules based on their charge. An ion exchange column contains positively or negatively charged ions that interact with the sample. Cation exchange chromatography columns retains positively charged molecules (cations) because the column contains negatively charged groups. Anion exchange chromatography is the opposite, it retains negatively charged samples because the stationary phase is positively charged. By increasing or decreasing the pH of the charged molecules can be eluted at different based on ionic strength. Separates molecules based on how polar or non-polar a molecules is. The stationary phase is more polar than the mobile phase, so molecules that are also polar interact with the stationary phase causing them to take longer to elute. Generally silica is used for the stationary phase and a non-polar solvent like hexane or chloroform is used for the mobile phase. The more polar the molecule the more it interacts with the stationary phase. The more non-polar the more it remains in the mobile phase. Reverse phase is the opposite of normal phase. Reverse phase also separates molecules based on polarity but does so using a non-polar stationary phase and a polar mobile phase. Hydrocarbon chains such as C8 or C18 columns are typically used for the stationary phase and the mobile phase is often water mixed with methanol or water mixed with acetonitrile.